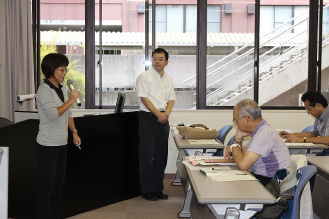 The Study Group for Izumo Myth Translation is a research project that was launched by researchers of this university, which is located in the region where the Izumo myths of the Kojiki took place, with the cooperation of regional experts. 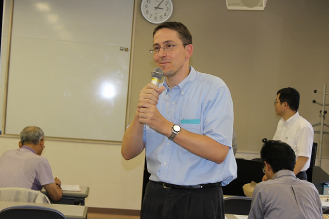 The project began in April 2011 to coincide with the 1,300 year anniversary of the Kojiki, with the goal of attempting to create English translations of the Kojiki. 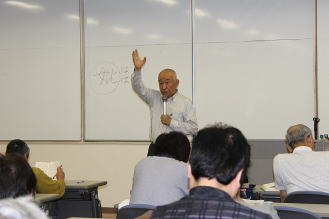 Leading the modern translation and interpretation of the Kojiki was none other than the spokesman of Izumo, esteemed academic historian, and Professor Emeritus of this college, Mr. Fujioka Daisetsu. English language and culture professors in the Department of Arts and Sciences (Yuji Matsuura, Yoko Kodama, Tetsushi Takemori* and Kriss Lange) were in charge of the English translations. *Now associate professor of Miyagi University of Education. 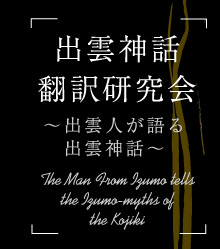 The interpretation and modern translation of the Izumo myths of the Kojiki as interpreted by Daisetsu Fujioka began from the public lecture series, “Study Group for Izumo Myth Translation” in 2011. 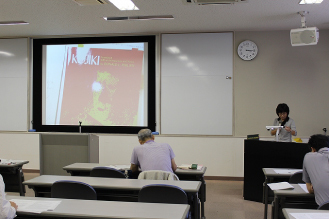 During that time we used “Kojiki” (Kurano,Kenji edition, wide version from Iwanami publishers) as our reference text. Modern English translations for the Kojiki have already been published but we suppose that local researchers would know the emotional context of the background of these myths better and may be able to produce a more appealing translation than researchers in other regions. The goal of this project was to provide an opportunity for a great many people to grow fond of Shimane’s irreplaceable cultural resources, the Izumo myths. Also, we hope that by creating a new English translation and transmitting these myths to the world, we can begin to develop interdisciplinary, comparative mythology research projects.